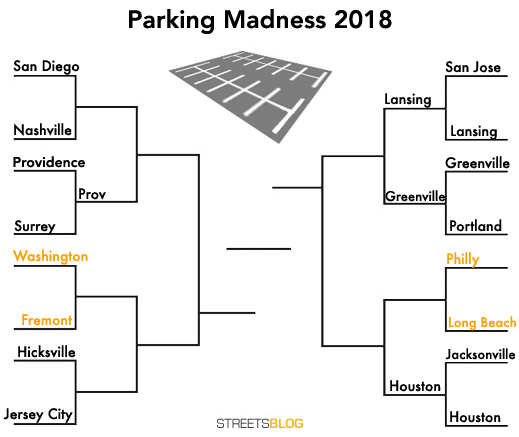 The search is on for America’s Worst Parking Crater™ and today we’re getting to know two more contenders in the 2018 Parking Madness bracket. Houston, Lansing, Providence, and Greenville have secured spots in the Elite Eight. Voting remains open in yesterday’s D.C. vs. Fremont match. Today’s match: A gargantuan sports complex in Philadelphia takes on a college campus in Long Beach, California, that leaves a lot to be desired. The South Philadelphia Sports Complex came to our attention via an anonymous reader. This is a rare triple threat, housing Citizens Bank Park (home of the Phillies), Financial Field (home of the Eagles), and Wells Fargo Center (home of the 76ers). 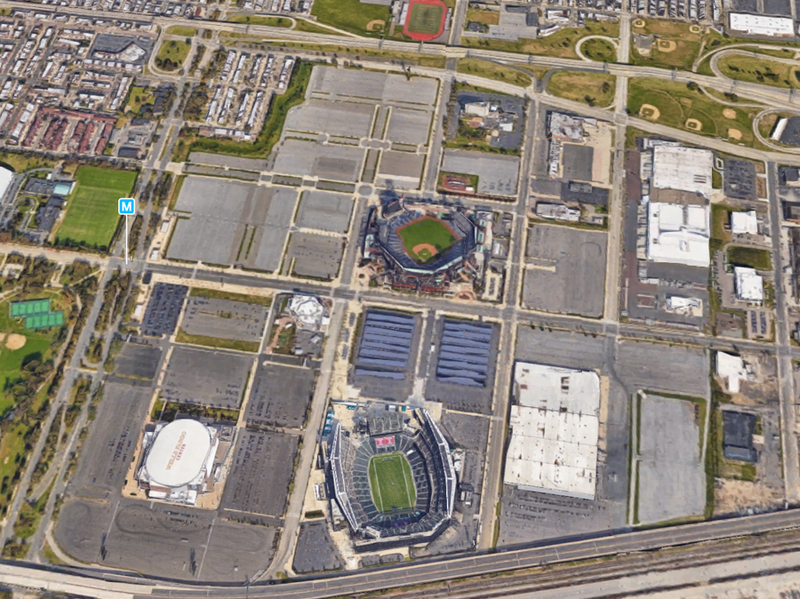 Instead of working out some sort of shared parking arrangement for these venues, it looks like Philadelphia paved enough asphalt just in case all three teams play at the same time and no one takes the train. Most of the year, as you can see in this photo, most of this space isn’t even used. To top it off, one of the biggest, most prominent structures in the photo — the rectangular grey building left of the pyramid — is a parking garage. To make matters a little worse most local off-campus Long Beach students who could arrive on foot or bike live to the west and therefore must traverse that lake of parking before they reach the campus. In one sense CSULB is a natural commuter school being surrounded by an enormous metro area. While it would seem that many of its students could easily save money by living at home, it is a false economy given LA’s notorious traffic. A student driving daily from Indianapolis to little West Lafayette to attend class at Purdue would seem absurd but that’s about the same amount of time students driving in from LA or Orange County would be stuck in traffic. Universities filled with parking always make me so sad. A university is a great opportunity to create livable public space — so much so that most of the non-automotive communities in the US are universities. 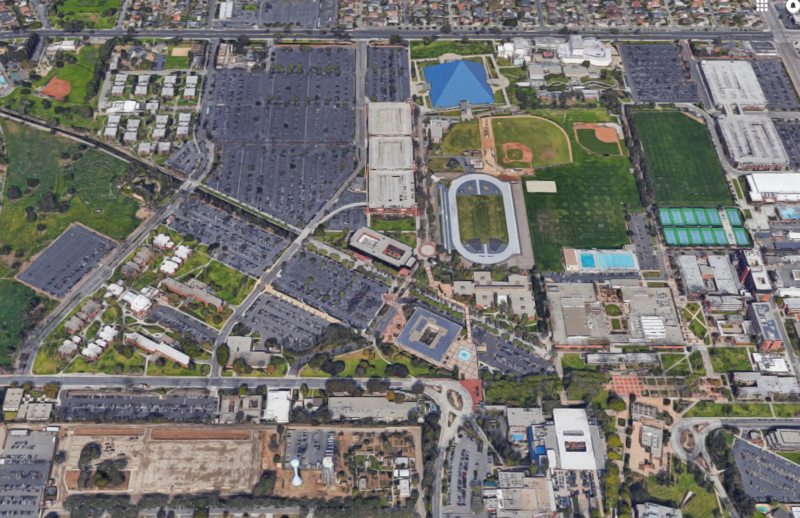 If Cal State Long Beach converted just the northernmost lot, which at 100,000 square feet holds about 350 parking spaces, into housing, it could create 400+ units of student housing in a 3-4 story building. Perhaps even a lot more since student housing is generally less space per resident. It’s obscene that a 30,000+ student university in a region as expensive as LA’s hasn’t figured this out and taken a different approach than just pouring pavement. Philly also made sure to build all the venues far from the subway station. I would love it if these were all electric car recharging spots. Then all of the spots would represent clean, efficient transportation. You could change this competition to a celebration of something posiive, where we would all benefit from the parking madness competition. Image a muncipality wanting to win. Wait, I’m sorry, a giant blue pyramid????!? The insane thing about all that parking in Philadelphia is that those stadiums are a 10 minute walk from the end of a two-level subway line that can handle people from multiple events coming and going at the same time. I am curious what %age of people driving could take SEPTA (and PATCO) services without incurring too much of a time penalty, particularly in the off-hours when sporting events typically end. Extra Broad Street trains run, but what if you need to transfer to a bus or another train to get home? The Navy Yard (which is cut off by I-95) is too far from transit for even the most mobile of riders. Only private entities like Urban Outfitters are offering limited shuttle service to near-ish transit. Parking these lots at the yard are necessary and add unique industrial capacity. The stadium lots are a ridiculous land use waste, but a different crater altogether. I don’t actually know numbers, but I see a good number of people using PATCO to get to and from the games, which is nice to see. Considering how horrible traffic is in those lots and on surrounding streets, I don’t think it’s honestly that much of a time penalty. While that helps, conversion from gas to electric solves only one of many problems of single occupancy driving. It is their basketball arena. That’s a good idea. That cluster of ~20 buildings just west of the northern lot is already dorms. Not sure i get where you are going. Alternate transportation, no emissions, quiet, simple. Viable option and smart technology. They left out 2 things about the lots in Philly. First Xfinity Live is located there and uses that parking as well. Second, the Holiday Inn is becoming a casino which will also need parking. Both of these are adjacent to the stadiums. .. but still requiring large amounts of space for parking and travel. Still as likely to kill or maim other people on streets. Still requires people to commit a large investment to use the system. Are you saying it is not about parking but the dislike of society’s desire or need to be mobile? That might be a discussion in a blog not called streetsblog. Cal Poly San Luis Obispo has been building student housing with the goal of having approx. 2/3 of students on campus. Currently, they are at 1/3 on campus. Long Beach could do the same… but they would still need to minimize the on-campus parking for residents, otherwise, what’s the point? Note: Cal Poly is building the housing on former parking lots. CSULB has actually gotten better over the years, using garages to free up land, but they should definitely build more dorms. The surrounding neighborhood is also mostly detached houses and could use more apartments for students (just don’t tell the neighborhood I said that). CSULB is a monumental disaster. It actually takes longer to get from the parking lots to one’s classroom than it does to drive to the parking lot from one’s home. A car isn’t necessarily required for mobility. I’d suggest that you read up on how overbuilding of automobile infrastructure has actually suppressed the viability of other mobility modes: transit, biking, etc. There’s plenty to read right here on this blog. Very good point. Schools make more money in beds filled then the classes filled. I’m going with Philly primarily because I feel like an northeastern city like Philly should know better and secondarily because it’s got a SEPTA station (the Long Beach one isn’t near a train station…although it’d be simple enough to run a quality shuttle bus between the train and the campus). thielges might be on the wrong site? You’re defending a parking crater on a submission that’s part of a series of nominating the worst parking crater in the country. If we are against parking lots, ok I get it. I proposed a not so far off scenario where we see a parking lot filled with plug ins for a clean alternative mode of transportation and thought it would represent a win. A lot filled with e cars represents a mode of convenient transportation that would be even cleaner than diesel trains which we do discuss on this site too. Only the football stadium does. Temple has their own on-campus arena. In addition to Urban’s busses PIDC runs two other bus lines to the Navy Yard for all employees. The first connects to the SEPTA broad street line, the second is an express bus from Center City that connects to SEPTA’s Regional Rail lines. Both are free to use. I dont know much about Long Beach but the South Philly complex has always annoyed me. It’s a cluster of mostly single use stadia that could be served by 2/3 of the parking in structured parking on 1/6 of the surrface area. Granted South Philly isnt on the gentrification agenda yet but what a great place to put in some affordable housing and mixed use developments. They don’t all need to take transit. How about you build structured parking on a quarter of the space for shared used and then develop housing and mixed use structures adjacent to the transit station for people that do want to use it? Every time I go down there its so depressing. Electric cars are only as good as the generation source though, which Im assuming is a lot of coal in the philadelphia area? The issue is the surrounding community, which is predominantly made up of post-war, low-density suburban housing tracts. A significant number of folks were absolutely up in arms about potential upzoning along the major arterials to 4 or 5 stories. They will lose their minds if anyone proposes even mid-rise student housing on campus. 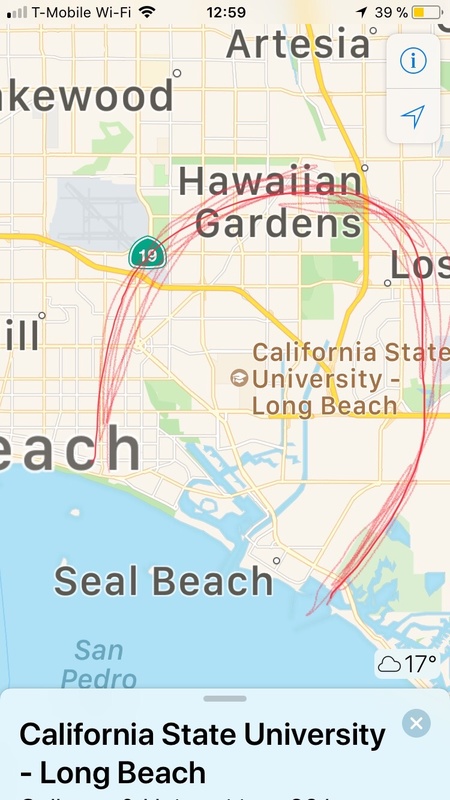 It’s why I would have voted for Long Beach as the worse parking crater–a stadium I can understand, but forcing students to drive less than 3 miles to campus (and not offering any connectivity for active transportation nearby) is an absolute travesty. These parking craters wouldn't be so large without government subsidies.